Do you need to perform Electrical Safety Testing of RCDs (safety switches) and other portable electrical appliances? Our PAT Online Testing Course and Assessment will qualify you so you can do it yourself rather than pay a Test and Tag contractor. Or are you a contractor who wants to learn how to provide Test and Tag services? Our PAT Online Testing Course will teach you how to use PAT testers and provide the Test and Tag certification as well. Our PAT Online Testing Course will allow you to learn how to use our PAT device/s and do just that! Once completed, you will have the knowledge and certification to perform your testing and tagging under current OHS&W regulations. Access the Test and Tag course and assessment from anywhere you have internet access. If internet access is poor, we can express post a DVD or memory stick with the lessons and documentation. 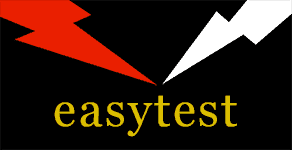 The easytest PAT Online Testing Course is Nationally Accredited. Our Senior Trainer, Tom, has 14 years’ experience professionally testing and tagging in four Australian states. He has wide-ranging knowledge in the test and tagging arena. He is an A class licenced electrician and also invented our PAT Testers. The original PAT won an Electronic Industry Award. What Qualifications do I get with the PAT Online Testing Course? UEENEEP026A: Conduct in-service safety testing of electrical cord assemblies and cord connected equipment. This course is only $330 per person, which is GST free. UEENEEP024A: Attach cords and plugs to electrical equipment for connection to a single phase 230 Volt supply for an additional $100 (GST free) when done concurrently with the main course (UEENEEP026A). If done alone, it is $330 (GST free). Who Needs to do a PAT Online Testing Course? People starting a new Test and Tag business will need to become certified to conduct the electrical testing. Any employees or contractors will also need to qualify by undertaking a PAT online testing Course, then complete the Assessment. People who want to be employed as a Test and Tag Inspector need to undertake a PAT online testing Course, then complete and pass the required Test and Tag Assessment. A staff member may provide the Test and Tagging services in some organisations. This person must have undertaken the PAT online testing Course and passed the required Assessment before they can legally conduct the test and tag testing. PAT Online Testing Course Discounts are Available! When you enroll two or more students you will receive a 10% discount off the course fee. If you purchase a Portable Appliance Tester (PAT) device at the same time as enrolling in the training course, you will receive a discount. More information can be found on our previous post, Test and Tag Course. Are you ready to enroll for our PAT Online Testing Course? Visit our training course page here and download the Order Form, complete it and email it in. It’s that easy! Test and Tag Course | Test and Tag Course Online | © 2017 easytest Pty Ltd. All rights reserved.